This beautiful apartment, located on the waterfront of Seccagrande, enjoys a strategic position: it is only a short walk from the beach, restaurants and groceries. Furnished with great care in a unique mix of freshness and tradition, it is composed of 2 double bedrooms and 2 with twin beds, three of which have sea views; 2 comfortable bathrooms; a well-equipped kitchen and finished in every detail and a large living room / dining area overlooking the veranda, strong point of the property. 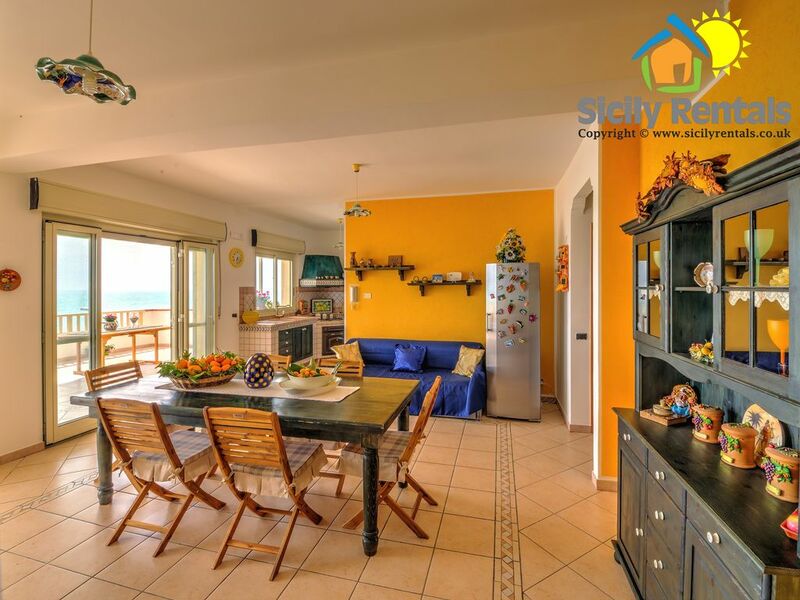 In fact it offers a splendid view at 250 degrees on the Mediterranean sea and, furnished with a dining table, chairs and sofas, will allow you to relax enjoying the view and the sea breeze. The colors, the beautiful landscape, the comfort of the rooms will make you feel at home and will make your vacation absolutely perfect! This top floor 4brm, 2 bathroom apartment at the very end of the SecceGrande strip is indeed “top floor”! 180 degree views of the coast and only steps to make it into the crystal clear and azure Mediterranean Ocean. The apartment is clean and well appointed with flat screen TV and good kitchen utensils with a large balcony to enjoy the million dollar, guaranteed postcard perfect views and sunsets each evening. The only minor quibble was no microwave and TV was Italian only. The SecceGrande strip itself has a family oriented outdoor nightlife with markets, fusbal games, evening concerts and outdoor bars and restaurants. It gives you a real taste of local living with fresh vegetables, fresh fish, bread and pastries all being sold from the back of local white vans.... who needs a supermarket! Seccegrande is also only a short drive to other interesting places such as Agrigento and Selinunte. We very much enjoyed our 9 night stay here and would recommend to families and empty nesters. This four bedroom apartment on the sea in Seccegrande was quite lovely. The photographs accurately reflect this rental. The view from the terrace is quite beautiful. It was very spacious and was very clean. The owner brought water and pastries for us when we arrived. Two issues of concern though. The first relates to a rather frustrating and time consuming check in that was initially delayed by an hour at the owners request then delayed further when the person who was to meet us did not respond to our calls. After making various calls we were finally met by the owner and another person who acted as translator and negotiator. Once there, we learned that one bathroom of the three was not “ working”. Additionally, the fourth bedroom was inaccessible as the door had been locked. We essentially did not receive what we had paid for and were disappointed. The views from this apartment are even better than the pictures! Several times while we were out touring the great sites nearby, we decided we'd rather be back at the apartment sitting on the deck. It was restful and gorgeous. The apartment itself is spacious, comfortable and very clean. Since we were visiting early in the season, a few stores and bars were open and the area was very calm. The hosts were flexible and quick to communicate. Thanks so much! Apartment was very nice, clean, well equipped and big. Owners were very kind and helpful. We felt ourselves very well. I highlight the great terrace with sea-view. It was perfect to have our dinners in the sunset! :-) Recommended place to be. In order to book the house the payment of 50% is requested as reservation deposit by bank transfer or credit card. The balance, together with the security deposit, will due the day of the arrival. Please note that the weekly price includes the final cleaning fee, that has to be paid once per booking (not weekly). Per prenotare la casa è richiesto il versamento del 50% della tariffa di affitto tramite bonifico bancario o carta di credito. Il saldo, insieme al deposito cauzionale, sarà versato il giorno dell'arrivo. N.B. I prezzi settimanali mostrati nel sito includono le spese di pulizie finali, tariffa unica per la durata del soggiorno e non settimanale.